The default touchscreen keyboard in Om 2009 is the Illume keyboard. 3.1 How to use the Qtopia keyboard shipped with Om 2008.8 ? 3.2 How to have a toggle button to make the keyboard appear/disappear ? 3.3 How to install the matchbox keyboard ? 3.4 How to install the illume (Raster's) keyboard ? 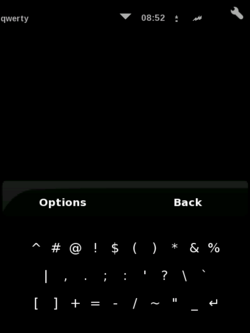 3.5 How to turn off the Qtopia keyboard ? 3.6 How to change the keyboards layout ? 3.7 How to change the dictionary used by the predictive keyboards ? 3.8 How to toggle the predictive mode on and off ? 3.9 How to make Qtopia keyboards and illume/raster keyboard coexist ? Om 2008.8 uses Qtopia for its phone stack. 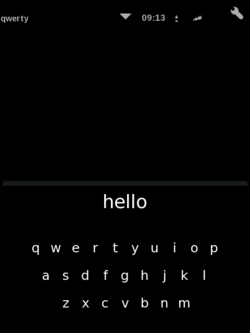 Qtopia has a build-in keyboard primarily designed to compose SMS in English. This keyboard is very impractical to use with a terminal or enter an URL. More details..., list of all keyboard bugs in the defect tracking system. The matchbox keyboard. See also homepage of Matchbox keyboard and Matchbox stroke. The illume virtual keyboard a.k.a. Raster's keyboard. It is hard to call this a key-board, it looks more like a pair of Ouija board than a matrix of buttons. But as far as an touchscreen input method for letters, this one allows the stylus to remain on the screen and move continuously. Needs a few hours of practice before writing words fluently. How to use the Qtopia keyboard shipped with Om 2008.8 ? Slide finger left = backspace. Slide finger right = space. Slide finger up/down = changes between lowercase/uppercase/numbers/special characters. Hovering over a letter for more than 2 seconds activates zoom mode, allowing you to type specific letters without prediction. Detailed version: see How to use the Qtopia keyboard. How to have a toggle button to make the keyboard appear/disappear ? Short answer: In 2008.8, opkg install illume-config. In testing, edit '/etc/enlightenment/default_profile' to use illume theme instead of 'asu'. Long answer: here. How to install the matchbox keyboard ? Short answer: opkg install matchbox-keyboard-applet matchbox-keyboard-inputmethod Long answer: here. How to install the illume (Raster's) keyboard ? How to turn off the Qtopia keyboard ? Short answer: Add the line export QTOPIA_NO_VIRTUAL_KEYBOARD=1 into the file /etc/X11/Xsession.d/89qtopia. How to change the keyboards layout ? See instructions on the Change matchbox keyboard layout page. How to change the dictionary used by the predictive keyboards ? You can compile your own wordlist or use precompiled wordlists. A better german wordlist, including proper names and nouns, can be downloaded from http://www.fragcom.de/server/fragcom_words . It is based on the Debian package "wngerman". Fourth, restart X or reboot your Neo. Matchbox has no predictive mode (to be confirmed ?). How to toggle the predictive mode on and off ? How to make Qtopia keyboards and illume/raster keyboard coexist ? Turn off the Qtopia keyboard and install the matchbox one instead. Keep the Qtopia keyboard, let go (for a while) the desire to use the terminal locally, login remotely via ssh when you need. Get an external keyboard, USB or Bluetooth, light and foldable if you want. Switch to 2007.2 (but then similar issues arise : Switching Keyboards on Om 2007.2), FSO or Debian. Patch Qtopia so that it plays nice with other keyboards, send upstream, meanwhile recompile and provide a package. PS: Complaining that management does not listen to the users needs is not a productive option. On August 27th 2008, Marek from Openmoko inc. announced the intention to focus on the low-level layers. Future "base system" distribution may not include any phone stack at all. This page was last modified on 20 September 2010, at 04:29. This page has been accessed 90,046 times.